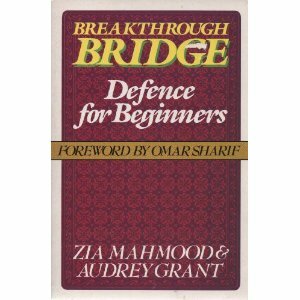 "Breakthrough Bridge" by Zia mahmood and Audrey Grant is a series of three books that take the reader through the basic fundamentals.Taking the reader through all the basic steps and situations involved in getting started in the game, choosing a partner, the language of bidding, responses, finessing, sure tricks and signalling etc. In "Planning the Play of a Bridge Hand", by Barbara Seagram and David Bird, beginning bridge players are taught some of the basic techniques of declarer play: suit establishment, ruffing losers, the finesse, etc. The difficult part is learning when each applies. This book, starting from the basics, explains how to go about making a plan as declarer. "Begin Bridge With Reese" by Terence Reese. Step by step, Reese takes reader through the basics of bridge: bidding, tricks and trumping, bridge lingo, defensive and offensive strategies, scoring, and, of course, winning. Includes clear sample hands to make each lessonr. "St. Peter's Just for Fun Bridge: In Five Easy Lessons" by Robert C. Jacobson. Would you like to learn to play bridge, just for fun? This little book offers a simple way to learn bridge with this fun system. If you've never played bridge, you may not understand the significance of everything, but by the time you finish the last lesson, it will come together for you. "Teach Yourself Bridge" by Terence Reese. A revised (1998) step-by-step approach to the game of bridge, suitable both for the beginner and those who are looking to improve their game. It includes a glossary for quick reference. In "Make a Start at Bridge" by Terence Reese and David Bird, two renowned bridge writers, begin at square one - presenting the glories of the game accessible to beginners of any age. A classic which is now out of print - so snap it up at a reasonable price. Nico Gardener and Victor Mollo are famed for their classic "Card Play Technique" and this "Bridge for Beginners" is for the less experienced player. "Bridge: The First principles" by Jeremy Flint and Freddie North. A guide for bridge beginners, with 100 hands exclusively devoted to card playing and defence, taking the reader from the most elementary concepts to an all-round grasp of the subject. 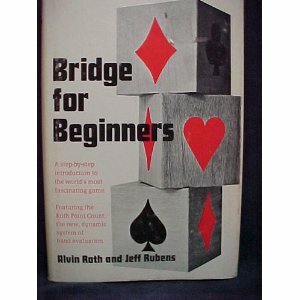 "Bridge for Beginners " by Alvin Roth and Jeff Rubens. Al Roth was a player who fell in love with "the beauty of bidding" is generally considered the premier bidding theorist of his bridge generation. Alvin Roth is credited with developing the negative double, the unusual notrump, 1NT forcing and the weak two-bid. "Discover Bridge, Play with Eddie Kantar" by Edwin Kantar. Easy to use, learn while you play. A World champion coaching you by your side. 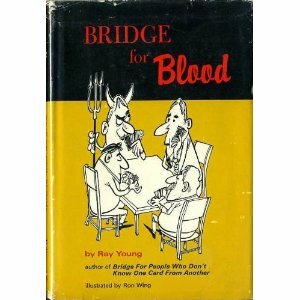 "Bridge for Blood" by Ray Young is an excellent book for the beginner, written and illustrated with a touch of humor, giving an attractive manner and good picture of the game of contract bridge. Delightful reading which gives a sound foundation in the fundamentals..
"Beginner's Bridge" by Derrick Browne is a straightforward introduction to the modern system of 5-card Majors.The author was a former Australian Youth Champion. Since becoming a bridge teacher in 1985, he has become one of Australia's leading teachers and directors and has become introduced thousands of students to the game as well as teaching thousands more at higher levels. He was also president of the Australian Bridge Teachers’ Association for three years. "How to Win at Contract Bridge in Ten Easy Lessons" by Richard Frey contains beautiful explanation of hand valuation which will help you to at least attain a thorough grounding of basic bridge principles. "Enjoy Learning Bridge: For Beginners and Intermediates " by Harry Weisz stresses the simple logical and reasonable approach in Bridge using the Standard American Principles of bidding recognized throughout the world. "Play Bridge in 10 Minutes: The Quickest Way to Learn the Game" by Brian Byfield. Play bridge in 10 minutes? “No way!” bridge fanatics will say. But Brian Byfield and Gray Jolliffe will prove them wrong. 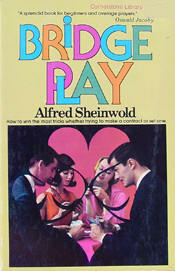 Their clear, lively writing, logical organization, and clever illustrations (all sweetened with plenty of humor) give bridge wannabes the confidence to sit down at the table with more experienced players, take part in the bidding and play (while observing proper bridge etiquette), and embark on a lifetime love affair with this fascinating game. "The Road Across The Bridge : A Relaxed Tuition in the Art of Bridge" by Bryan Stevens is a book for those who wish to learn the basics of bridge from scratch. Readers will be introduced to the playing cards, the four suits and the trumps then afterwards taken through the play with a partner by what is called minibridge and there are several easy to follow instructions. Then it is on to bridge proper to learn how to play the game. The bidding process is discussed in very easy stages with many illustrations along the way and there are some tests and welcome pauses for revision. Readers will also learn a few of the many conventions and some of the playing tactics that make the game so interesting and finally to take a look at what goes on at the local bridge club. It's not all Bridge however, because between each tutorial chapter there is a bit of nonsense on some of life's happenings and some humour from the author's experience at the several Bridge clubs of which he has been a member, which hopefully will take away some of the strain whilst learning this very interesting game. "Back to Basics: Simple Minded Bridge" by Jim King. Bridge is a simple game that has been complicated by special conventions, contrivances and gimmicks. This book teaches bridge in a way a third grader can understand. If you can count to 40 you will understand this book and learn to be a very good bridge player. Bridge is taught as a "fun" game, not a battle between enemies. There are over 100 practice hands included. Winner of the American Bridge Teachers' Association 2007 Book of the Year award in its original self-published edition, "Gary Brown's Learn to Play Bridge" has been given a new look and feel while retaining its refreshing approach to teaching bridge. It is designed as a short first course for newcomers to the game. No prior experience is required with any card game, and the ideas are developed in short, easy steps. Includes chapter summaries and practice exercises. 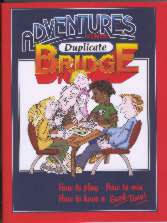 "Adventures in Duplicate Bridge: Everything You Ever Wanted to Know About Duplicate Bridge - and quite a few things you didn't" by Edith McMullin is a colorful, fun-to-read, full-size 58 page booklet. It keeps newcomers and novice players active and playing more. For social, rubber and up to 2nd year duplicate players. It explains nuances of the game and the book provides a useful reference for teachers running a novice program. "Bridge Game Summary: Easy reference and Game Companion" by Samir Riad combines the easy reference of color tables with a brief explanation of how to play the game. It's the best of both worlds for beginners and casual Bridge players alike. Need help bidding? Or, responding to a bid? Just check the "bidding" section. Want to know what card to lead? Check the "play the hand" section. Need a reminder of the most popular Bridge conventions? They're all there where you need them. Need to know how to write the score and how many bonus points are awarded for a grand slam? Check the "keeping the score" section. This book explains the game of bridge in a brief and easy to understand way. Bridge is the most challenging card games, one that's next to impossible to learn without a whole host of visual aids. But many books on the subject all too often seem to ignore this. Enter the new (2010) book "Knack Bridge for Everyone: A Step-By-Step Guide to Rules, Bidding, and Play of the Hand (Knack: Make It Easy)" by D. W. Crisfield, which takes a step-by-step visual approach to explaining the game clearly to beginners and intermediates. With 400 full-color photos, as well as numerous charts and diagrams, it begins with the rules and the fundamentals of bidding, play, defense, and scoring. It then improves your bidding by introducing more bidding techniques and strategies for winning. From the Back Cover: Bridge is a famously challenging card game, one that’s next to impossible to learn without a whole host of visual aids. But books on the subject all too often seem to ignore this. Enter Knack Bridge for Everyone, which takes a step-by-step, visual approach to explaining the game clearly to beginners and intermediates. Not only does it give you what it takes to hold your ground no matter what your hand, but it takes the bidding up a notch by introducing more bidding techniques—and strategies for winning. "Basic Bridge Quick Reference Guide: A Guide to Better Bidding" by Lynda Connolly. This bridge guide lays the groundwork for assessing the value of your hand and helps you quickly determine your bid. It lists a variety of opening bids, what they mean, what your partner’s responses mean, and how you should rebid. Straightforward charts allow you to go directly to how you should reply to a bid or what convention should be used. There are also charts for defense bids and responses, bidding slam, and playing strategy. It emphasizes the importance of partner agreements in advance of play. Use the Basic Bridge Quick Reference Guide to improve your game, and improve your communication with your partner during the bidding process. You will want everyone you play with to have this book! Unlike many beginner books, "We Love the Majors" doesn't oversimplify the game for ease of consumption. This is an honest presentation of the modern game-complexities and all-but expressed in terms everyone can understand and apply. Want to begin teaching bridge, but not sure where to start? "Teacher's Manual for We Love the Majors" is a comprehensive and easy-to-follow teacher's manual was designed by the authors of 'We Love the Majors', Mary Ann Dufresne and Marion Ellingsen, to compliment their reader-friendly beginner's book. The teacher's guide contains six complete, detailed lesson plans, including hand diagrams, that teachers can easily customize to suit their students' levels of "interest and experience". This guide puts all the information you need to share your love of bridge right at your fingertips! - Example hands and how to bid them. - Quizzes to check your progress each step of the way. - Exercises to help you visualise your partner's hand. - A glossary of bridge terms for quick reference. 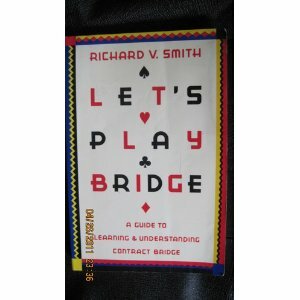 ''Let's Play Bridge: A Guide to Learning and Understanding Contract Bridge'' by Richard Smith is a modern (1987) comprehensive 440-page paperback introduction to the game. It is a reasonably length guide to the game and is quite and bit longer and more in-depth than some of the simple, short introductions in other books. It is a good book, but you would probably only want to get this if you are serious about getting into the subject, not something to just look up the rules in. "Contract Bridge" By Alan Truscott. The game of Contract Bridge is a challenge to your intellect and competitive instinct - your passion for winning. As a beginning to intermediate player, you will encounter, through play-by-play explanations and simple diagrams, how to react through every hand. Do not worry. You have the foremost authority as your teacher. No longer will you have any apprehension, for you will become the feared pro! The Beginner's 21-Day Guide to the World's Most Popular Card Game. A comprehensive, 3-week, day-by-day bridge course for the beginner by the bridge editor of The New York Times. 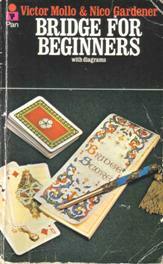 "Enjoy Beginning Bridge: How to Enjoy Learning Beginning Bridge" by Andrew Giordano, The Recent Beginner. 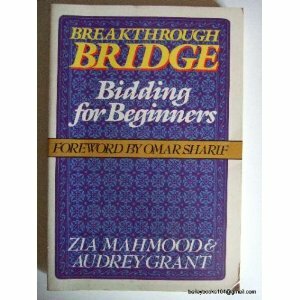 Most beginning bridge books are written by truly gifted experts who have long forgotten what it was like to be a beginner. They have understandably forgotten that learning bridge is akin to learning a second language. As a result, most beginning bridge books are written in "bridge-speak" and the beginner has the same experience as anyone watching a foreign film without sub-titles. This book is unique in that the author was a real recent beginner when writing this book and knew how to convert "bridge-speak" into language a beginner can understand. A robust 8 page glossary is provided and with this approach the beginner becomes "fluent" in bridge terms as he is being introduced required bridge skills. "A First Book of Bridge Problems" by Patrick O’Connor comprises fifty problems in declarer play and defense for the beginning player, presented in approximate order of difficulty, with emphasis on planning the play at the first trick. Learn Bridge the Easy Way: by George Sturgis Coffin. A fast teaching guide to the Culbertson system and the new point count bidding based on the winning technique of Ely and Josaphine Culbertson and the methods of the American Contract Bridge Leagues. Or buy from Amazon.co.uk .